In Rosemary’s “Inspiration” video this week she refers to an event we shared on Kauai, Hawaii’s Garden Island. I still use this moment, it only lasted for seconds, to remind myself of the exquisite nature of life, especially as we live it more and more consciously. It was an overcast day and moving on toward late afternoon as we climbed that winding road up to Waimea Canyon. When we reached the park and canyon overlook, the clouds were thick and it was difficult to see into the canyon to any depth; the far side was shrouded. But as with everything in Hawaii it was still breathtaking. We were considering our return trip down that road full of hairpin turns when the setting sun broke through the clouds behind us and created that incredible double ring rainbow Rosemary describes, casting it on the far side of the canyon. As we stared in awe we noticed shadows at the rainbows’ center. Other tourists on a lower observation platform pointed at it and then up at us and shouted that they believed it was our shadows; we waved our arms and the shadows within the rainbows waved to us in unison! It was us! This was an image and a feeling I will never forget. It was like Heaven reached down and blessed us. The sense of grace and peace was overwhelming. To this day I carry that image and the feeling as one of those fantastic (miraculous?) ‘Aha!’ moments in my life. One of the exercises I have learned in my Qigong practice with Bridget Hughes is to cultivate the “Feeling State of the Divine.” This is a tremendously powerful healing state to build and to live within. An exercise to build this Feeling State is to recall moments in our lives in which that Feeling State was powerfully present. 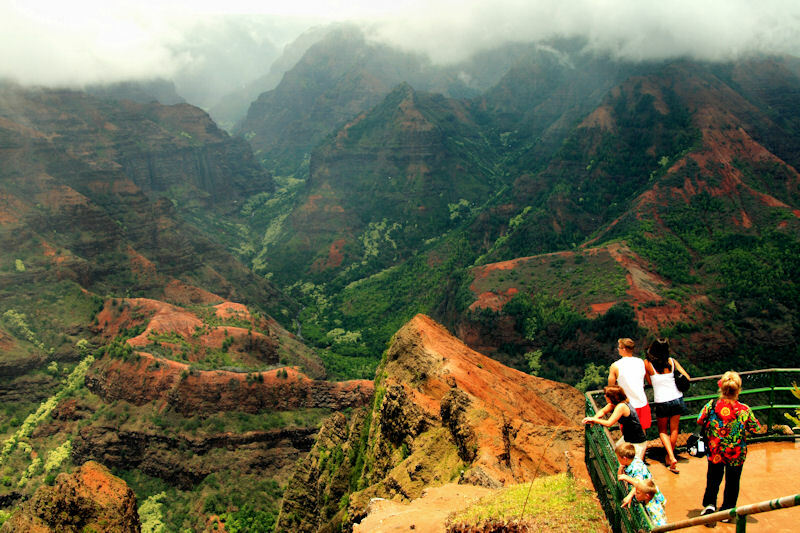 Well, you can bet this experience at Waimea Canyon is one of those Feeling States and I recall it frequently! People need to know that their thoughts are creating their physical reality. There is a connection between the dimensions of Consciousness and Physical Existence on Planet Earth. Thoughts can cause a shift in physical reality and these thoughts depend on the beliefs behind them. When our thoughts are focused on the Feeling State of the Divine we are in a deeply creative mode that can shift everything. In this time of great Earth Transformation it is our Human Consciousness Transformation that can and will make a difference. Think good thoughts! Recall those Exquisite Feelings of the Divine, those “Aha Moments”, those Peak Experiences that help us transcend the petty, the small, the insignificant and transport us to that place of power and Love! PS: Time is running out on that “Aha Moment” waiting for you on The Other Side! There are exquisite connections you can make there tomorrow! Friday, June 14, at 7:00 pm, either online (internet or phone) or in person in Annapolis, you can join Rosemary for a Conversation with The Other Side to hear what beings on The Other Side have to tell you. Angels, Guides, Loved Ones come to offer their joy! There’s still time to register! Get more information here. « ROSEMARY’S EXPLORATION: Pay Attention to Your ‘Aha!’ Moments!